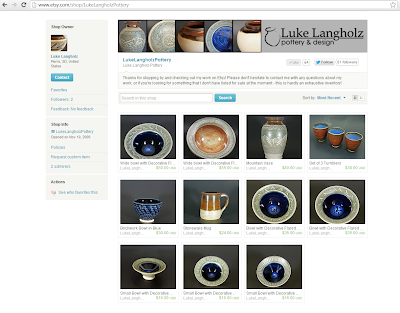 Luke Langholz Pottery: Luke Langholz Pottery now available at Etsy! That's right! You can now buy my pottery online via Etsy, right here! There are a handful of pieces available right now, and will be updating to provide a variety of work, or at least a reasonable sampling of all styles that I do. Of course the challenge of this sort of thing is deciding how many pieces to list when there are individual listing fees and keeping track of that inventory and blah blah blah... mostly I'm glad to be able to share this! Prepping the shop has been keeping me busy - shooting pictures, tracking measurements and pottery dimensions, setting up the account... in addition to throwing and trimming and all that jazz in preparation for some Christmas orders folks have gotten in to me. So lots of that going on as well. Anyhow. Go check it out! And maybe buy something, eh?